Here is my plan for the fire pit project to appear on national television sometime next month. Step one was to paint the shed and clear the area. I then purchased 4 green chairs like the ones pictured above. I am not collecting the materials for the fire pit. What do you think? Any other suggestions? I would love your thoughts! Area before I started the project and the Pinterest board I am storing my fire pit area ideas. This book will help you downsize your life. Relationships and experiences are a place to spend time and money. Stop buying stuff, stop cleaning stuff, stop organizing stuff, and live your life! I wrote “50 Things to Know to Downsize Your Life” because I wanted to create a concise guide for people to follow to learn to live a better life with less. 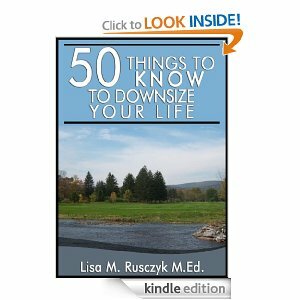 This is a collection of 50 simple tips that any person who would like to know while learning to downsize their life. The book offers practical tips for your bathroom, kitchen, closet, bedroom, downstairs, children’s rooms, and even what to do with your extra time. The book also includes 10 things to know to save money on your electric bill.